Battle through side-scrolling, anime-inspired worlds as Ninjin, a charismatic bunny, or as Akai, a ninja fox, to recover your village’s stolen carrots from the claws of the evil Shogun Moe. Take down throngs of enemies and bosses, collecting carrots along the way. Spend 'em in the Corgi Store to purchase new equipment, or the Shady Shop for special weapons, tons of masks, and a bunch of other customization items. 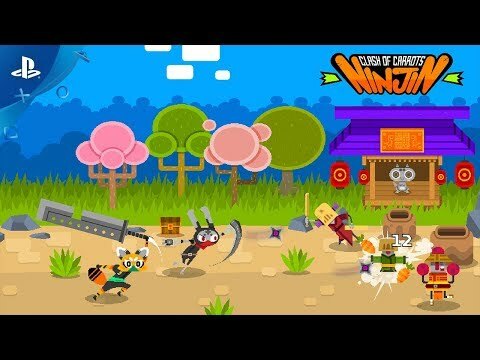 Ninjin: Clash of Carrots was released on PC, PS4, Switch and Xbox One 227d ago in the US and the UK. Notify me when Ninjin: Clash of Carrots is available.